Since the Spring of 2006, New York’s Baby Shakes have released two singles and one ten-inch. All of which are now out of print. Each new record proved much better than the one before, and now we’re ready to lay it all out there in the form of their first full length LP/CD with complete confidence that this record follows the same trend. The First One is the title, and it contains ten songs with licks as good as the looks. The Baby Shakes haven’t parted with the pop sensibility that was the backbone of their previous releases, but they have successfully figured out to incorporate the influences of all those glam records littering up their tiny New York apartments. The album has a few quick poppy tunes, but the majority of the record feels like Slade wrote a bunch of songs for the Shivvers. And that’s a good thing! The First One also features remarkable production (and drumming) from Mr. Dave Rahn of The Carbonas and Gentleman Jesse. First 100 are half blue, half pink. Enjoy! The Bay Area’s latest buzz is from a band called Buzzer. This proto punk three-piece features dudes from The Impediments behind Andy Jordan of The Cuts and The Time Flys. 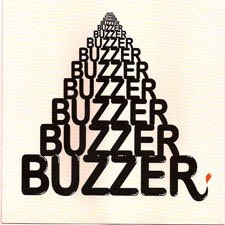 Buzzer’s debut three-song single generates the same mid 70’s adoration as Jordan’s previous projects sans the sleaziness of the Flys and the drug induced euphoria into which The Cuts would often drift. The marching snare on Disco Kiddz makes you wanna get real high and play flag football with your not-to-particularly-tough friends. “Cool Feeling” is essentially a glam popper, but the other two tracks sorta remind me of early Pere Ubu with Verlaine on vocals. First 100 are on white vinyl. Awesome. Hopefully got order in for Baby Shakes early enough for color vinyl. Woo hoo!